I've read one of her mystery books but was not impressed! I am a fan of her Regency romances and have almost all of them. This one though sounds intriguing. Because of you, dear Sergio, I began re-reading Carr's books. I recently reread and loved, 'SHE DIED A LADY' and now I've gotten my hands on; AND SO TO MURDER and THE EMPEROR'S SNUFF BOX. 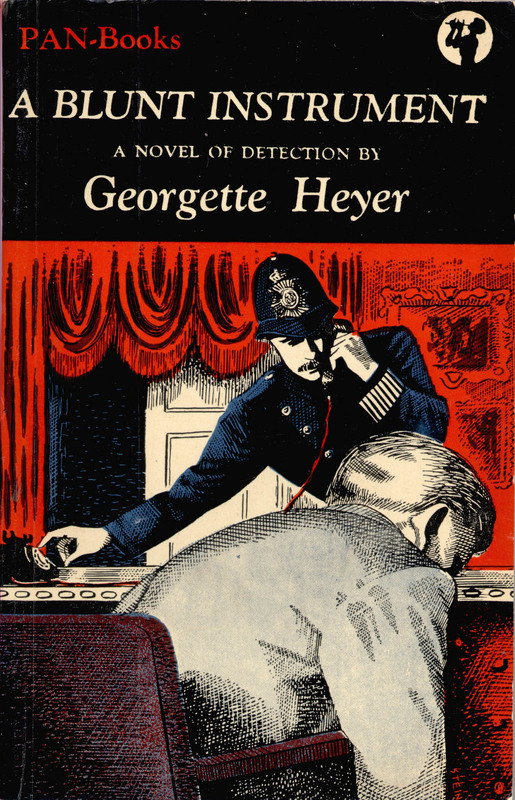 In comparison, Heyer's mysteries are rather less frenetic and of course, they are of the cozy school of mystery writing. But very well done. I just began NO WIND OF BLAME (an Inspector Hemingway book) which I somehow seem to have overlooked over the years. Well, they are cozies but at the same time they are clever puzzles. You'll just have to try one or two (two is fairer) and see if you like them. Heyer's Regencies are exceedingly clever and well plotted, so it is not surprising to me that she gave mysteries a try. The mysteries I liked are DEATH IN THE STOCKS, BEHOLD, HERE'S POISON, A BLUNT INSTRUMENT, THE UNFINISHED CLUE and, I think, DETECTION UNLIMITED (which I have to reread soon). I'm reading NO WIND OF BLAME now and so far so very good. Avoid PENHALLOW which is a horrible aberation and not worthy of Heyers. I also don't like ENVIOUS CASCA though everyone else loves it and some consider it her mystery masterpiece. It's up to you. :) Thanks for dropping by. These books are my refuge, Mudpuddle. Though I do also read more contemporary authors, lately I'm indulging my vintage gene. :) I'm not a big fan of ENVIOUS CASCA, but I know I'm in the minority. To be honest, Yvette, the closest I'm likely ever to reading one of these mysteries are your highly enjoyable reviews of them. And, who knows, they might just wear down my resistance one day! Oh, I suspect these books are not for you, Mathew. But thanks for reading my reviews and commenting anyway. Much appreciated. I keep planning to read some Georgette Heyer mysteries and then never actually get to them. I have read some of them, but like you, I won't remember much at all. I do plan to get to at least one of them before the end of the year. Yvette, I couldn't agree more. Authors like Georgette Heyer are a splendid tonic for "frazzled nerves." We need books to keep our wits and sanity. Absolutely, Prashant. If I didn't have my books to 'hide' in I don't know what I'd do. They are my refuge. I've tried to read this one a few times now. I'm convinced I'll like it, but for whatever reason I never get into it. I guess I'll have to wait until I'm in the right frame of mind.